We strive to serve all our customer’s needs in providing for both regulatory compliance and in creating the safety possible work environment for their employees. As we continued to grow our company over the years we listened to our clients and developed services that fit their needs while ensuring the same high quality and attention to detail they have come to expect from us was maintained as we added these support services. If you’re in need of assistance in any of the areas listed below, please feel free to contact us and we will be happy to discuss these services with you. You need not be a current client of ours to take of advantage of the myriad of services and resources we have to offer. Health and Safety Programs Whether you need a single OSHA required Safety Program written, reviewed, or modified to ensure compliance and incorporate best industry practices, or you need an entire health and safety program for your facility or entire company written and implemented, we can provide you with outstanding, cost effective, personalized service. We work with our clients to develop corporate or site-specific programs that fit their needs. Emergency Response Plans We have developed Emergency Response Plans for numerous clients over the years ranging from comprehensive plans providing contingencies and response protocols for all potential emergencies to plans for hurricane preparedness and response to avian flu pandemic business continuation plans. Whatever your needs, let us put our decades of expertise in planning, preparing for, and responding to, emergencies of all types to work for you in ensuring your business is ready should a disaster strike. Safety Compliance Services can provide your organization with OSHA’s annually required respirator fit testing service for all your employees who utilize tight fitting respirators in the course of their work. 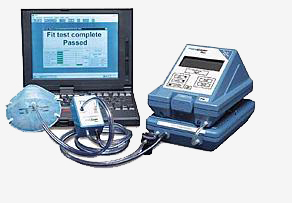 We have the capability to conduct both quantitative and qualitative fit testing depending upon your needs and preferences. This can be accomplished as part of providing your employees with annually required respiratory protection training or as a stand alone service. Many employers find themselves uncomfortable with trying to determine which, if any, confined spaces on their premises meet OSHA’s definition of Permit Required, and, for those that do, what rescue resources are necessary to comply with OSHA’s requirement for rescue from permit required confined spaces. We have years of experience in assessing workplaces to identify all confined spaces and designate those that must be treated as permit required. Additionally, we develop rescue plans for all such spaces to allow employers to develop the rescue contingency that best fits their needs and resources while ensuring OSHA compliance. Our Confined Space Assessments are comprehensive and thorough identifying and documenting everything from hazards, to access, to ventilation, to entrant equipment requirements, to rescue planning. Why contract an outside party to conduct a safety audit or gap analysis at your facility? In most cases an outside auditor will see hazards and unsafe conditions even the most trained and competent in-house safety representative will not. This is not due to incompetence or neglect on the part of the facility safety team, rather it is a result of normal human nature whereby complacency and normalcy of deviation over months or years of time, have dulled an in-house safety professional’s ability to recognize what is readily apparent to a fresh objective eye. We have years of experience in working with clients to conduct safety audits and best practice/regulatory gap analyses and have a proven track record of satisfied clients who have benefited from hiring an experienced team to conduct an independent, objective audit and analysis of their operations and personnel. Rescue Team Development If you need assistance in complying with OSHA requirements for rescue when employees or contract personnel enter Permit Required Confined Spaces, we can help. Let us assess your needs and your resources to determine the most cost effective and efficient way to provide for the safe and compliant rescue of personnel entering and working within confined spaces at your facility. We will help you determine what rescue contingency options work best for your situation and, if determined in-house rescue capabilities are your best course of action, we will help you to develop such a rescue team through planning, equipment selection and procurement, and training. Many workplaces that require the support of numerous contractor personnel during normal operations or during maintenance outages often find it difficult to ensure all contractor personnel that work at their site are adequately briefed on the facility hazards, behavioral rules, safety policies and work permitting protocols as well as how to report and react in an emergency at the site. For many, the most cost effective and efficient solution is a site-specific, custom Safety Orientation video that all contractors and/or visitors are required to view prior to working or entering the site. We have been producing Safety Orientation videos for our clients since 2003 and have put our experience in safety into the content and format of our video production efforts. Unlike many other video production companies that, while very capable of producing professional quality videos, lack the depth of background in safety to ensure the content captures all important safety issues, we know what needs to be included in such a video and what is best left out. We work with each individual client to develop the video content unique to their needs while ensuring it is comprehensive and pertinent to the prospective audience.